Danny Coupe after winning his Eastern Counties title. Peterborough Police Amateur Boxing Club fighter Danny Coupe won an Eastern Counties title at the weekend. 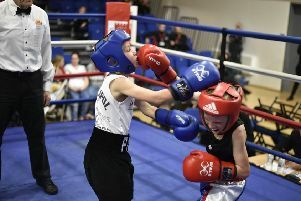 The 16 year-old from Holbeach came up against a much more exprerienced opponent in J. Buckland from the Billericay club but proved far too strong for the Essex fighter in his Eastern Counties Novice Championship final in Billericay. Coupe, who was having his first fight of the season, worked cleverly inside and scored well with some lively uppercuts. Coupe’s stablemate Imran Aref will also be boxing at the same stage of the tournament after receoiving a bye at the Eastern Counties stage. Daniel Meins (29) from Dogsthorpe also boxed at the Billericay finals. He came up against Paul Gordon from the Harwich ABC in and just lost out on points. Gordon was 6ft 4in tall and his height advantage proved decisive. Meins will be back in action on October 28 at a show in Burton Park when 11 year-old clubmate Imraan Shirazi from Bretton is set to make his his ring debut.